Instead of handing over the Korean Export Processing Zone (KEPZ) to the investor, the government of Bangladesh plans to take back part of the 2,492 acres of land allotted to the KEPZ 16 years ago. The country’s largest private export processing zone is in a web of land-related and legal tangles triggered mainly by the non-cooperation from the local administration and some government agencies and public representatives. 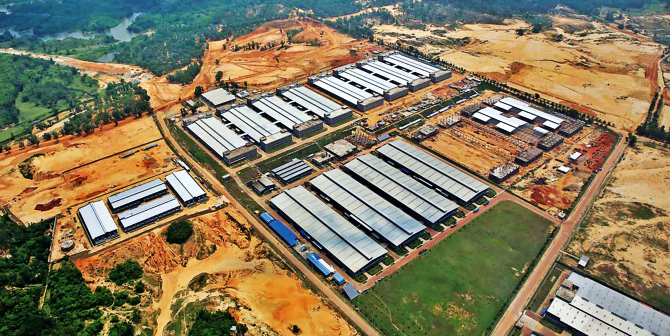 The government is yet to hand over the transfer deed for the land in Anwara upazila of Chittagong to the KEPZ owner, Korean YoungOne Corporation, creating obstacles to investment. Several foreign investors, including the Japanese, over the years had contacted the KEPZ for plots but had to back out realising the land-related complications. Without having the land deed, YoungOne could not offer them any plot. Now the land ministry has begun the process for getting back the land on the grounds that YoungOne had not been able to set up industries there, ministry sources said. In recent days, the government has been promising Japanese and Chinese investors land and other facilities. Prime Minister Sheikh Hasina at the ground-breaking of KEPZ on October 31, 1999, had pledged full support for the zone. But the company faced hurdles at every step, from getting the environmental clearance to electricity and water supply. The investor had to wait for eight years to obtain the operational licence from the authorities. The environmental clearance was issued after 10 years, in 2009, and that too was cancelled three years later and then given back after five months. The Department of Environment (DoE) had cancelled the clearance in March 2012, alleging the KEPZ was cutting hills and damaging the environment. The certificate was returned once the allegation was found untrue. But a case filed in this connection against KEPZ employees is yet to be withdrawn. “We were supposed to get 160 megawatts of electricity in phases and 80 million cubic feet of gas a day. We got only 14 megawatts and no gas supply whatsoever as of today,” said Mr. Mohammad Hasan Nasir, the KEPZ Managing Director . About 84MW electricity from a 100MW power plant built for the KEPZ is being supplied to others. There were no telephone connections and fresh water supply, he said further. The authorities concerned cut off electricity supply in 2012, forcing the KEPZ to run its factories on diesel generators causing huge financial losses for the investors inside the KEPZ. The supply was restored after more than a year following an order from the Supreme Court. On the land being taken back, Mr. Nasir said the government could do it by force but it would be unethical and illegal. “It will seriously affect foreign investor confidence in Bangladesh,” he said. “Now our main concern is not development and investment but legal battles to protect the KEPZ land from being taken over,” said the MD, who and some other officials and employees of KEPZ are facing over a dozen cases, including two attempted murder cases. Many in Chittagong believe some local ruling AL leaders and businessmen were behind the troubles the KEPZ was facing. The land has become very lucrative after development. There is also an indirect pressure on the KEPZ to let go of a part of the land, they added. The Local Government Engineering Department (LGED) is another agency to cause the KEPZ trouble. It gave fund to Boirag union parishad to illegally develop an earthen road inside the zone last year. As police took no action, the KEPZ authorities went to the court. The Chittagong DC visited the spot asking both sides to keep the road as it was. But nothing could stop developing the road. Despite all these difficulties, the Korean company has developed a substantial area by turning the barren hillocks into a productive industrial area spending $250 million. It constructed 21km of roads, housing for investors and officials, 17 lakes and planted 1.6 million trees. YoungOne set up seven shoe and garment factories creating jobs for 6,000 locals. Four more factories would start operations by December. Once fully operational, the KEPZ would employ 3.5 lakh people. It has plans to set up a school, a residential university, a business development park and an IT park and a hospital but land-related complications are delaying those. YoungOne, which started working in Bangladesh in 1980, has industries in Dhaka and Chittagong EPZs with 60,000 workers. It has operations in 12 other countries. During the ground-breaking, Hasina hoped that YoungOne would be able to showcase KEPZ as a model for private sector industrial development in Bangladesh. The KEPZ officials said it would be possible only if they got support from the government.